Come see a wide assortment of Veiled Chameleons, Baby Veileds, and Veiled Chameleon Morphs for sale. Ready-to-assemble, aluminum screen cages are perfect for your chameleon. The Veiled Chameleon (Chamaeleo calyptratus), also known as the Yemen Chameleon, is a relatively large chameleon species originally from Saudi Arabia and Yemen in the Middle East. More recently, this species has been introduced and has established small populations in areas such as the island of Maui in Hawaii. In its natural range, the Veiled Chameleon lives in coastal mountain slopes, which experience significant rainfall, and some live in slightly more arid “wadis” with year-round water and vegetation. Veiled Chameleons are a large, colorful species, which are easily recognized by the large casque or helmet of males on the top of the head. With males reaching a total length of as much as 2 feet and females reaching a total length of approximately 18 inches, this is one of the larger chameleon species seen in captivity and one of the most beautiful. Adults of this species exhibit coloration including different shades of green, orange, yellow, blue, browns and black with a combination of strips and spotted patterns. Veiled Chameleons can be sexed from the day they hatch. Veiled Chameleon males are born with a small nub on their back foot called a tarsal spur that females lack. Veiled Chameleon males of this species tend to exhibit more colors as well as a larger casque then female veiled chameleons and on average live 6-8 years. Females of this species typically show less vibrant colors and live on average 4-6 years because even when not bred, they will produce infertile clutches of eggs, which take a lot of energy. A common misconception with chameleons is that they are very difficult animals to keep in captivity. Fortunately, captive bred veiled chameleons purchased from a reputable breeder are actually quite hardy when provided with consistent care and a proper enclosure. 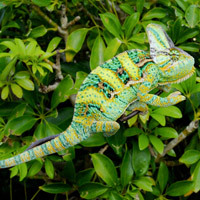 In the past, it was difficult to obtain chameleons that were not wild caught. These wild caught chameleons are difficult to acclimate to captivity and often did poorly, even for experienced reptile keepers. Now that dedicated, reputable chameleon breeders are reliably producing high quality veiled chameleons, this stigma is no longer an issue. 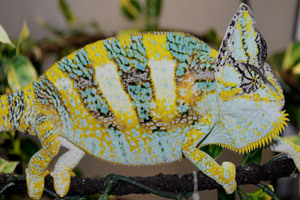 Veiled Chameleons do well in captive environments with consistent care. The first step toward successfully keeping your chameleon happy and healthy is to set up their enclosure. 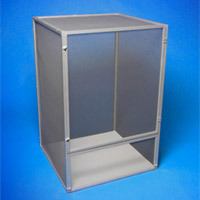 Veiled Chameleons do best in screen sided enclosures because of the increased airflow. Glass tanks, on the other hand, are difficult to find in appropriate sizes and create stagnant air, which can lead to upper respiratory infections. 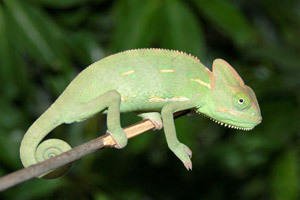 With adult veiled chameleons, the general rule is that bigger is better as far as their enclosure is concerned. An adult male would ideally be housed in a screen enclosure around 2’ x 2’ x 4’ tall, although they can tolerate somewhat smaller enclosures. Female would ideally be kept in a screen enclosure around 18” x 18” x 3’ tall. Babies and juveniles can be kept in smaller screen enclosures (16” x 16” x 30”) until they are approximately 8-10 months old, at which point they will need to be moved into a larger enclosure. If you are purchasing a baby chameleon, it is best to start with a small enclosure and then move up to a larger cage when the chameleon gets older. Finally, it is generally best to keep chameleons individually after they reach sexual maturity at around 8-10 months old to avoid potential stress and fighting. 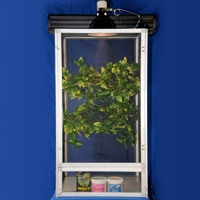 The interior of the enclosure should be furnished with medium sized vines and foliage for the chameleons to hide in. The medium sized vines provide important horizontal perches for the chameleon to rest, bask and travel on. Synthetic plants with plastic leaves (not silk) can be used in conjunction with common, non-toxic plants to provide ample foliage. Commonly used non-toxic plants that can be used include Ficus, Schefflera, Hibiscus and Pothos. These live plants not only provide cover but they also help to maintain humidity inside the enclosure. The bottom of the enclosure should not have a substrate as substrates can cause impaction, provide a hiding place for feeders and harbor bacteria and fungus. Instead the floor of the enclosure can be kept bare or have a layer of paper towels, which should be changed regularly. Veiled Chameleons need two forms of light for approximately 12 hours a day. First, they need access to a light heat source to bask and regulate their body temperature. Heat rocks, heat tape, ceramic heat emitters, etc., do not provide veiled chameleons with a heat source they recognize so it is important to provide them with a basking spot using a heat bulb and an incandescent fixture. Next, they need a special fluorescent bulb that provides UVB light waves. UVB, which is usually provided by natural sunlight, is important in calcium metabolism pathways but is filtered out by glass and therefore must be provided by artificial lights to help prevent disorders such as Metabolic Bone Disease (MBD). As tempting as many bulbs that provide both UVB and heat may be, studies have shown that chameleons are able to regulate their body temperature and their UVB exposure independently so it is important to provide heat and UVB separately. Both these lights should be placed on the top of the enclosure with the closest perches approximately 6-8” below. Veiled Chameleons, like other reptiles regulate their own body temperature and it is thus important to provide them with a temperature gradient inside their enclosure. The best ambient temperature during the day for Veiled Chameleons is room temperature, between 72 and 80 degrees Fahrenheit. By placing the basking bulb approximately 6-8 inches away from a basking perch inside the enclosure, a basking spot of approximately 85-95 degrees Fahrenheit is achieved. This arrangement provides the warmest temperatures directly under the heat bulb and cooler temps lower down in the enclosures. Additionally, chameleons do well with a night temperature drop so no additional heat source is needed at night as long as your temps stay above the mid to high 40s and the chameleons are able to bask in the morning. If your night temperatures do necessitate a heat source, it is important not to use one that emits light. Instead, a ceramic heat emitter should be utilized from a safe distance. Being arboreal, veiled chameleons do not typically encounter standing water such as a water dish. As a result, they typically do not recognize water dishes as a source of water for hydration. They drink water from morning dew and rain as it falls onto leaves. As a result, it is important to mist your Veiled Chameleon with a spray bottle twice a day for approximately two minutes getting all the leaves and branches wet in the enclosure. Your chameleon will lap water up from the leaves. You can also create a drip system to provide water over a prolonged period. By taking a clean plastic water jug and poking a couple small holes in the bottom, water will slowly drip out over a period of time and fall onto leaves in the enclosure below. Finally, while waterfalls may seem like a nice addition to an enclosure and like they would help with humidity, chameleons are attracted to moving water sources to defecate. As a result, waterfalls quickly before cesspools filled with bacteria and can be extremely detrimental to your chameleon’s health. Veiled Chameleons can be fed a staple diet of crickets. In general, crickets should be as long as your chameleon’s head is wide. Baby and juvenile Veiled Chameleons should be fed once or twice a day and have almost constant access to food. As they get older, you can feed slightly less often with adults being fed every other day. It is important to supplement your crickets with calcium and vitamins (Reptivite) to help promote proper growth and health. This is especially important for reproductive females and growing babies and juveniles. For babies and juveniles you will need to dust your crickets with calcium two to three times a week and dust with vitamins once every two weeks. As adults, this dusting regiment can be decreased. It also helps to provide your crickets with nutritious food including collard greens, mustard greens, squash, orange and/or commercial cricket diets. It is important to keep in mind that veiled chameleons do best as primarily display animals. While different veiled chameleons will tolerate handling to different degrees based on their individual personality, veiled chameleons should not be handled like a bearded dragon. They can be carefully held for short periods but tend to get stressed with excess handling. 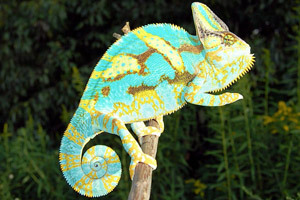 With time you will learn what your veiled chameleon’s personality is like and what your chameleon will tolerate. When you do handle your veiled chameleon, do not restrain it but rather let the chameleon walk on you from hand to hand. You should be aware that veiled chameleons are most comfortable when they are high up so often times when they are being held, they will attempt to walk up your arm and try to go onto your head. For long-term success with all chameleon species, limited handling is recommended. With the proper setup and consistent care, your Veiled Chameleon should do very well. 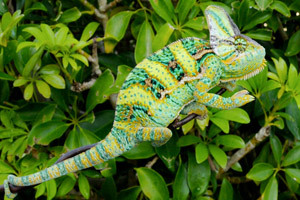 The Veiled Chameleon is a striking, beautiful and hardy captive, which is excellent for the first time chameleon owner. Their relatively simple care requirements, impressive features and odd behavior make them an interesting and conversation starting display for any dedicated enthusiast.